No matter how hard she herself had to work to survive and to feed her two children, Aleya never wanted her daughter to work. As she had done with her son, Aleya sent her daughter to school, for she wanted her to get an education and, later, marry. But 10-year-old Nupur was only in "Chhoto 1" when her father, Sabuj Miah, took her away from her mother -- his first wife -- and brought her to Dhaka. As far as Nupur can remember, he had at first tried to sell her off to two men in exchange for a fat wad of cash. But when she warned him that if her mother found out, he would have her to contend with, he broke the deal and instead gave her to a couple to work as a domestic help. According to Nupur, after arriving at the Banani Rd. 4, Chairman House of employers Shamim and Shabana, Nupur's workday began the next morning at eight. She was not given any breakfast or lunch the whole day and was too shy to ask for it. With her salary fixed at a monthly Tk. 300, Nupur was already busy doing her many chores -- which included "dusting the furniture, sweeping the floors, doing laundry, washing the dishes and cutting up vegetables". At one point, says Nupur, while handling the dishes, her employer's 5-year-old child started to pull at her dress, and when she tried to free it from the child's grip, she dropped a dish and the child fell to the floor and began crying. Shabana came into the room to find her child crying and asked Nupur whether she had hurt the child. When Nupur said no, Shabana slapped her and sent her into the bathroom. Following her in with pieces of cloth and a rolling pin, she twisted the girl's arm, tied her hands and feet and gagged her. She then brutally hit her on the head, face and arms, chest and legs, with the rolling pin. Pouring boiling water on Nupur's feet, Shabana made her walk with scalded feet. "There was blood all around me," recalls Nupur, pointing at her still swollen black eye and the stitches on her head. After beating her mercilessly, Nupur's employers put her on a bus to Gandaria, warning her that if she ever identified them, they would say that she had run away after stealing money and jewellery from their house. When asked to get off the bus at Gandaria because she could not pay the fare, Nupur asked the bus driver's helper whether she had arrived in Pabna -- her home. Seeing her hurt and bleeding, a boy on the bus took her home to his mother. When they could not get her admitted into the local hospital, they brought her to Dhaka Medical College Hospital (DMCH). 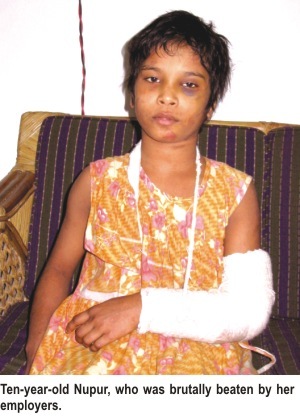 After spending a couple of days in the Casualty Ward, Nupur was shifted to the hospital's One-Stop Crisis Centre (OCC). Nupur's parents have not yet been contacted; her mother, Aleya, does not yet know that her worst fears have been confirmed. A case has been filed under the Prevention of Women and Children Repression Act. Nupur's employers are nowhere to be found. Bruised all over, her arm in a cast and unable to see in one eye, Nupur, by now, seems quite used to telling people about her ordeal. The long, dreary corridors of DMCH seem to ring with the same or similar stories being repeated over and over again. However, every time another Mostakina, another Putul, or another Nupur cries out in pain when she is tortured, one cannot help but wonder whether the world has gone completely deaf.